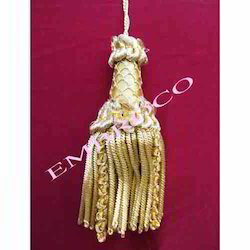 Leading Manufacturer and Exporter of Bullion Tassels such as Multi Bullion Tassels, Handmade Tassel, Decorative Tassel and Tassel Trim from Varanasi. These are highly demanded by our customers. Multi Bullion Tassel have become the part of the modern interiors. Very ornate in appearance, trims come in large variety of shapes, sizes & colors, specially made for embellish & enhance soft-furnishings. Our Bullion Fringes are available at most competitive price. The Handmade Tassel that we design and manufacture are handmade and come in different eye catching colors. These tassels are made from rayon, metallic yarn, cotton, polyester and other raw materials. These silk tassels are used as bookmarks. Available in vibrant colors, these tassels can be custom manufactured in different sizes. 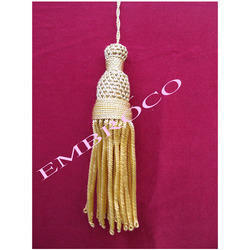 We are manufacture, exporter and supplier of Decorative Tassel. The range was widened to include textile trimmings of all kind. We sell trendy fashion trimmings, latest drapery Tiebacks, beautiful decorative tassels and variety of small tassels for craft supplies. Tassels manufactured by us have found numerous uses as Key tassels, beaded tassels for home decoration, bookmark tassels, Invitation tassels, Upholstery. We are manufacture, supplier and exporter of Tassel Trim. Owing to aesthetic design and excellent finish, these tassels are widely demanded by large number of clients. 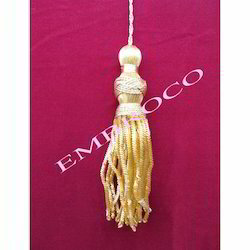 We offer various patterns and styles of curtain tassels as per the exact requirements of clients. 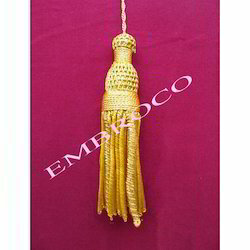 Besides, the entire range of curtain tassels offered by us is available at cost effective. Looking for Bullion Tassels ?